Could life exist on the Red Planet? Image uploaded July 18, 2013. Did life on Earth originate on Mars? Or did Earth dispatch life to Mars aboard a meteorite more than 3.5 billion years ago? In order to investigate the possible origin of life on Mars and Earth, a team of researchers from MIT, Harvard and Massachusetts General Hospital (MGH) want NASA’s next Mars rover to probe the Red Planet’s surface for genetic material by analyzing soil and ice samples with a DNA-sequencing microchip. "If there’s life on Mars and it is based on RNA and DNA, you would get not one but many sequences and you’d be able to understand the extent of ‘relativeness’ of any Earth life," said study lead author Christopher Carr, of MIT’s Department of Earth, Atmospheric and Planetary Sciences. "You could use that to determine whether it’s contamination from Earth — or whether it's actual Martian life," Carr told SPACE.com. "And that would also allow us to say how Martian life is related to Earth life." The project is based on the assumption that life on Earth and Mars (if it ever existed) could have shared genetic ancestry. During a period called the Late Heavy Bombardment, about 3.5 billion to 4 billion years ago, there were a high number of major impact events in the solar system. About 1 billion tons of asteroids zoomed through space between Earth and Mars, possibly cross-contaminating the two planets. "Some of that rock was transferred in a way consistent with life as we know it," Carr said. "It wasn't too hot, it was relatively quickly transferred so that it wouldn’t be damaged by space radiation. If life was around on one planet or the other, it could've hitched a ride and ended up on the other planet … So the question is, if there's life on Mars and we’re related to it, then how can we detect it?" In order to search for this kind of life, the team wants to equip NASA's 2020 Mars rover with a device capable of sequencing RNA and DNA — very specific indicators of life. Such a sequencer could "only target life that is there now or recently dead because nucleic acids don't stick around that long; the oldest nucleic acids that people have been able to sequence here on Earth are less than a million years old," Carr said. "Mars is colder, so maybe we can go further back in time, but a million years may be a pretty good limit." For a sensitive DNA chip to work on Mars, it first has to survive the months-long space journey, during which the spacecraft will be exposed to high doses of radiation. The conditions on Mars itself are harsher than on Earth: the Red Planet's atmosphere, made mostly of carbon dioxide, is 100 times thinner than Earth’s. Temperatures on the surface can plummet to minus 195 degrees Fahrenheit (minus 126 degrees Celsius). 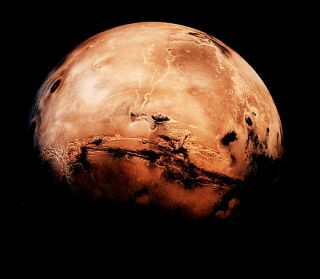 But the environment below the Martian surface may be similar to that of our own planet and may hold all the major elements required for life, some scientists say. The team has tested several sequencing microchips with 1.3 million microwells, each able to hold a single bead containing an amplified fragment of DNA to generate a DNA sequence. The researchers subjected the chips, along with the reagents required for sequencing, to Mars-mission radiation levels and then used the devices to analyze the DNA of E. coli bacteria. "The main component of space radiation is protons, and you also get a lot of protons from the sun," Carr said. "We tested the chips at the NASA space radiation lab, the Brookhaven National Lab, exposing it to 1 and 5 Gy doses — above what you would expect for a human mission, and of the order of what you would expect or higher for a two-year mission to Mars, with some safety factor." Then the researchers loaded the chips with DNA fragments from E.coli, finding that they were still able to analyze DNA and identify the bacterial sequences. Chris McKay, a planetary scientist with the Space Science Division of NASA's Ames Research Center, who was not involved in the study, said a radiation-resilient DNA-sequencing chip would be important for future missions to Mars and other corners of the universe. "An instrument that can detect and sequence DNA is definitely something that should be included in any life detection mission," McKay told SPACE.com. "It would have the benefit of being highly sensitive to a fundamentally important bio-molecule. The next step in this technology is to modify the instrument so that it can sequence any long chain of nucleotides with different backbones: DNA, RNA, TNA, PNA, and so on."